Rockinghorse is an independent charity, which aims to make life better for sick and disabled children in Sussex and Surrey by ensuring medical facilities for children and young people are as cutting edge, comfortable, friendly and accessible as possible. 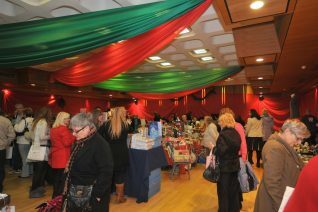 Last Sunday there was a Christmas Fair held in Hove Town Hall to raise funds for this very worthwhile organisation. And just to make it really feel like Christmas it snowed in Hove. 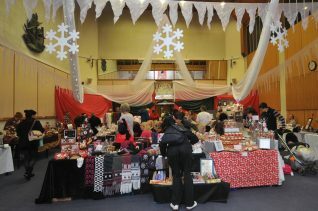 There were lots of stalls and activities to interest and entertain all the family. 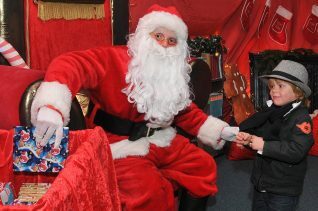 Of course Father Christmas had travelled from the North Pole for a visit, but he was so successful that he had to leave early as he had run out of pressies. 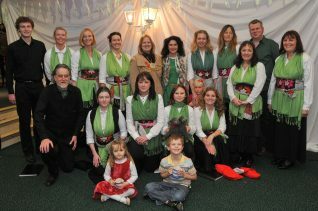 One of the other highlights of the day was a recital from the Polina Shepherd Russian Choir; their wonderful performance enchanted the crowd. The fair was attended by The Mayor of Brighton and Hove, Councillor Anne Meadows and her Consort Tony Meadows, and raised £546 for Rockinghorse. If you would like to find out about Rockinghorse please visit their website. Jennifer: were you there? I usually sing with the Russian Choir but couldn’t on this occasion because of a clash of dates. Nice pic by Tony! Editor’s note: I don’t attend these events Jackie – I just write them up. Tony does so many every week – I wouldn’t be able to keep up. Glad it was such a success.